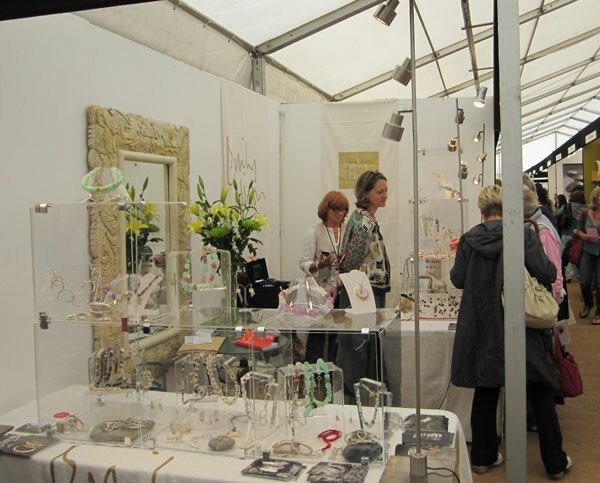 We have always wanted to visit The Contemporary Craft Fair at Bovey Tracey. But as it’s 10 miles south of Exeter, it’s a bit too far for a day trip from Derbyshire. But then Anne made the discovery that the fair this year fell on the same weekend that we were travelling back from Cornwall. It presented us with an opportunity not to be missed! Admission included an A4 program of events and exhibitors. The fair runs for a total of three days and there is a variety of workshops that you can join. Anne really wanted to attend one on paper jewellery construction, but with a long journey still ahead of us, there was really only time for a quick browse. 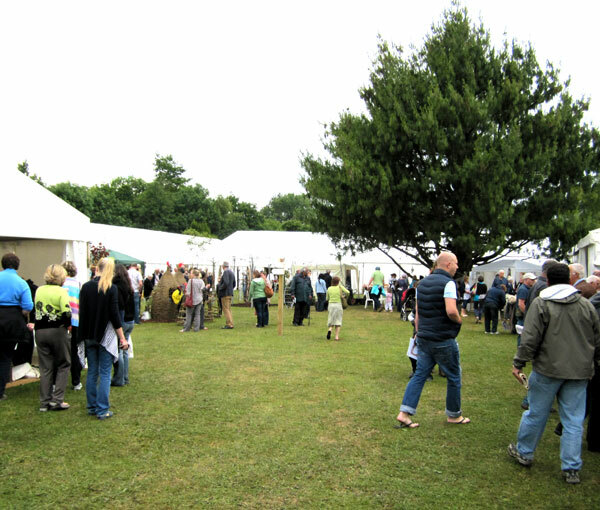 In total there are three marquees filled to the brim with exciting stalls to tempt you. 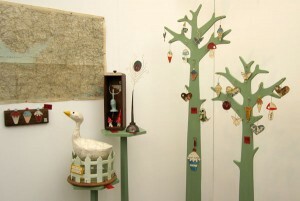 One of the stalls that really stood out was by Anya Keeley. 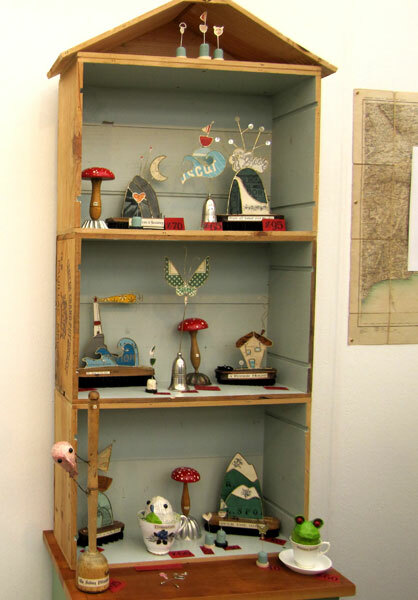 Anya describes herself as a designer & maker of caged animals curios and whimsies. Her stand won the prize for the best stand at the show and from these pictures it’s easy to see why. We had a great fondness for her display trees. If you’ve ever seen us at a show you’ll know that we have a very similar tree for our jewellery. Great minds and all that! Anne took a real shine to the bags made by Alison Hughes. 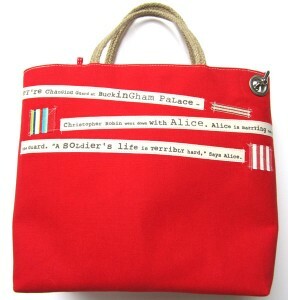 In fact she bought a gorgeous Lewis Carroll inspired one. Alison creates under the name Dr. Bean. All Dr. Bean bags are handcrafted on the Isle of Wight. They’re not too big, they’re not too small, they’re just right! They are also sturdy and practical. Each bag comes with an identification number and a handy shackle. 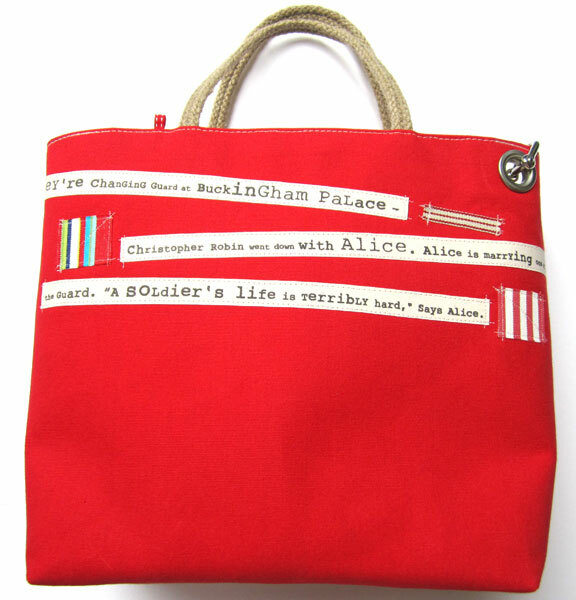 Bags with stripes or bags with words – the difficult bit is deciding which one . . .
Anne’s bag was called ‘Changing The Guard’. I was partial to the bags bearing the shipping forecast. 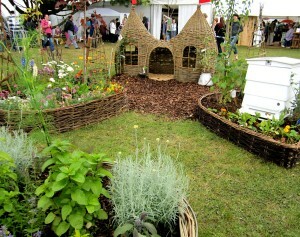 The fair also had a lovely little bee keepers garden in the centre featuring a willow structure by Judith Needham. How I wish I had one in my garden! There were also many smaller tents in the materials and making area including Selvedge Magazine, Homes and Antiques Magazine and the Shelanu: Women’s Craft Collective from Birmingham. If your party contains children, then fear not, they are well provided for. With Punch and Judy, face painting, sand pit, soft play and a children’s craft tent. Finally I had to show you this strange tree. 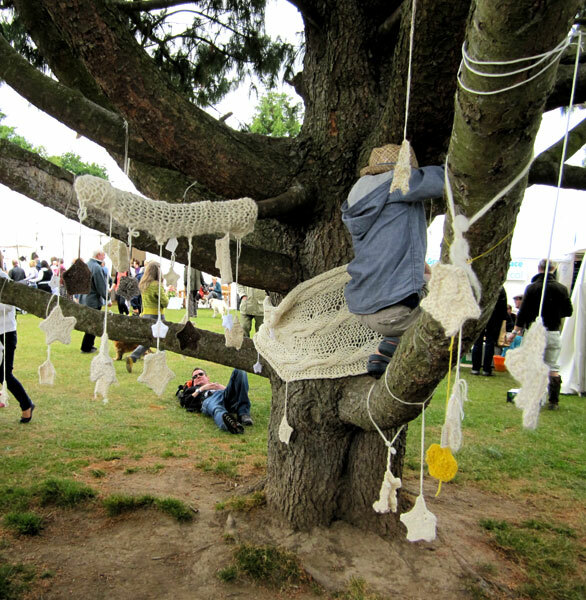 In a small tent called the Knit expo you could sit and knit decorations for the tree. It was also apparently perfect for climbing. We were delighted to have visited this year, it’s certainly worth the travel. When it comes round again in 2012 definitely organise a trip in that direction!